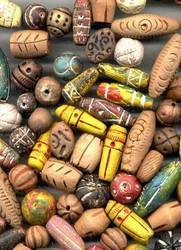 Who will not be enthralled by wearing these carved & painted wooden beads, a perfect harmony of beauty and perfection. Terracotta (which is eco-friendly) natural material beads are made out of it and baked and painted in attractive colours. It gives a rich and traditional look to Jewelry and other decorative items. It can be painted and can be made as per the requirement of the customer and designers. (PRICE ON REQUEST). Beads Size 16mm x 20mm, 20mm, 22mm apprx. Offering many designs of wooden beads as well as painted wooden beads which is very highly demanded for jewelry making. These hand painted glass beads are the paradigm of aesthetic workmanship. They can spellbind the onlookers at once. These heart stealing hand painted glass beads fuse the fashion with beauty and surpass the charm of other beads. Glass hand painted beads graced with stylish designs make a significant contribution to the appeal of innumerable handcrafted items. 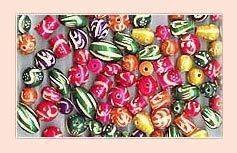 we are one of the leading painted glass beads suppliers and glass beads exporters. Our valued clients can avail the offered products in both customized and standard forms as per their requirement. We are Manufacturer of Wooden Beads & Painted Wooden Beads. Our product range also comprises of Military Badges, Family Crest, Banners and Pennants and Decorative Items.